When I found this Weight Watchers Beef Stew Recipe for the crock pot, I literally was drooling. Though I initially thought it was just a traditional beef and vegetable stew recipe, it’s actually a classic Jewish recipe for Tzimmes! I’ve had Tzimmes before, but I’ve never had it prepared with the beef and vegetables so I was so excited to give it a try, and YOWSA!! IT WAS SO YUMMY!! 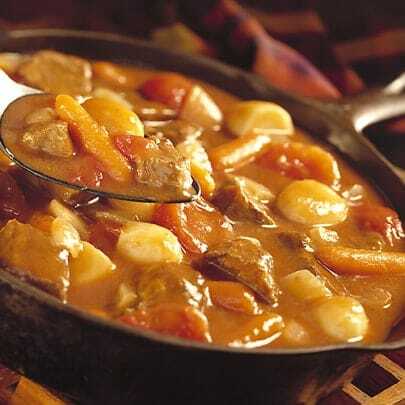 Hearty and delicious, this Weight Watchers Recipe for Beef Stew is an incredibly filling meal, and with 8 Weight Watcher Points per serving, it’s much lower in calories than most stews. Try serving this stew up with a tasty 0 Points Salad for a complete and tasty meal! But keep in mind that it will also make a wonderful Passover Recipe and/or Hanukkah Recipe! This Weight Watchers crock pot recipe offers a truly unique and delicious take on beef stew by adding in some non traditional ingredients like prunes, cinnamon and honey – and it is definitely worth trying! NOTES: You can substitute dried apricots for the prunes if you prefer. Cook on low setting for 7 to 8 hours. About 5 minutes before serving, stir in remaining 2 tablespoons of lemon juice and remaining 2 teaspoons of honey; cover and cook on low for 5 minutes. Was skeptical about a stew having prunes but I am so glad that I tried it. The stew was delicious. Lovely flavour and goes great with a slice of bread (I know that shoots the points…sigh). Very filling stew. This was amazing! The whole family loved it. It does seem like an accessive amount of beef though? What would be the Points Plus value? Yes, you can, though it will change the flavor and texture a bit. Thanks for sharing – this was delicious and indeed very filling, with plenty of leftovers for lunch during the week. I may use a touch less of honey next time, as this was a little sweet for my taste. Absolutely delicious! And so filling that I only had 1 cup. My whole family loved it. Didn't even tell them til they were done that it was a WW recipe. Can't wait to have the leftovers. Thank you so much! I made this tonight for dinner on a rainy, dreary day. Perfect! Thanks for posting it! I just have to say, this is one of the best recipes I've made from your website. It was filling and sweet and yummy! Even my husband enjoyed it and wanted seconds. I didn't give him any. Too many points. Oh wow. I've only had tzimmes that was sweet and contained raisins. I bet this is a lot better.